I’m excited to let you know that the new NAKIVO Backup & Replication v7.2 is now available for download. In this post, we will take a look at the new features of NAKIVO Backup & Replication v7.2 and find out how each of them may help you, if you use them in your virtual environment. The best way to offload your VMware or Hyper-V infrastructure from data protection workloads and achieve better performance is to create a dedicated VM backup server by installing NAKIVO Backup & Replication on a NAS server. This way you can create a superior all-in-one VM backup appliance, which can provide you with 2X better performance, if compared with a VM-based backup solution. When it comes to selecting a NAS device, you could previously choose from among supported QNAP, Synology, and Western Digital models. However, the new v7.2 offers you to create a reliable, energy-efficient, and high-performance VM backup appliance by installing NAKIVO Backup & Replication on a NAS server made by ASUSTOR. This way you can combine great features of NAKIVO Backup & Replication with power saving features, an efficient cooling system, and the high quality of ASUSTOR NAS and get an affordable VM backup appliance. Already have an ASUSTOR NAS? Download and try NAKIVO Backup & Replication v7.2! Now we will move on to another great feature of NAKIVO Backup & Replication v7.2 – Transaction Log Truncation for Microsoft SQL Server. A Virtual Machine using SQL Server databases may suddenly fail because it has run out of free space. Where have all its gigabytes gone? The matter is that Microsoft SQL Server transaction log files can accumulate and finally fill up the whole VM storage space causing the VM crash. Fortunately, it is possible to prevent this scenario. When you back up your VMware or Hyper-V VMs running Microsoft SQL Server, these backups contain all necessary transaction log files, and you no longer need to keep these files on the source SQL Server. NAKIVO Backup & Replication v7.2 can automatically truncate SQL transaction log files, which frees up storage space. In case of any failure, you can easily restore your data from the VM backup containing all transaction log files necessary for successful recovery. We hope you regularly perform Application-aware Backup of Microsoft SQL Server to be able to recover in case of failure. However, when it comes to data loss, it is not always the entire SQL Server that is corrupted, but some part of it, like a single table, or a single database. In this case, recovering the entire VM would be unnecessary, time-consuming, and unreasonable, especially if the SQL Server contains a large number of databases. This is where the new Instant Object Recovery for Microsoft SQL Server feature added to NAKIVO Backup & Replication v7.2 comes into play. It provides the ability to recover a single table, a group of tables, or one to several databases within SQL Server directly from the deduplicated and compressed VM backup. All you need to do is to select necessary objects and a server to which you would like to recover these objects. After that, NAKIVO Backup & Replication can do the magic, quickly restoring all of the selected objects back to where they belong. The process is automated and very fast, so you save your precious time and nerves. VM backup imposes an extra load on your infrastructure, especially in large virtual environments comprising thousands of virtual machines running a variety of applications. Therefore, in large environments it is significant to carefully schedule backup jobs and avoid overlaps. This is what the Calendar Dashboard was created for. It is always useful to have a scheduling tool in hand. After all, you do use an Outlook or Google calendar, or any other planner application, or at least a paper daily planner to schedule your daily tasks and meetings, don’t you? Otherwise, you would be swamped by doing several tasks simultaneously on some day of the week and idle around on another. Your backup jobs need scheduling the same way your daily tasks and meetings do. The only difference lies in the consequences of ignoring the scheduling need. If multiple tasks coincide in time, any of them can be moved to some other time or another day with no drastic consequences. However, in case numerous backup jobs concur, this may increase load on your virtual Hyper-V or VMware environment, or cause a VM slowdown. The Calendar Dashboard built into NAKIVO Backup & Replication v7.2 was designed to address the key challenge of backup schedule overlap. The major idea behind the development of this feature was to create an easily operated tool making the job scheduling process straightforward and convenient. 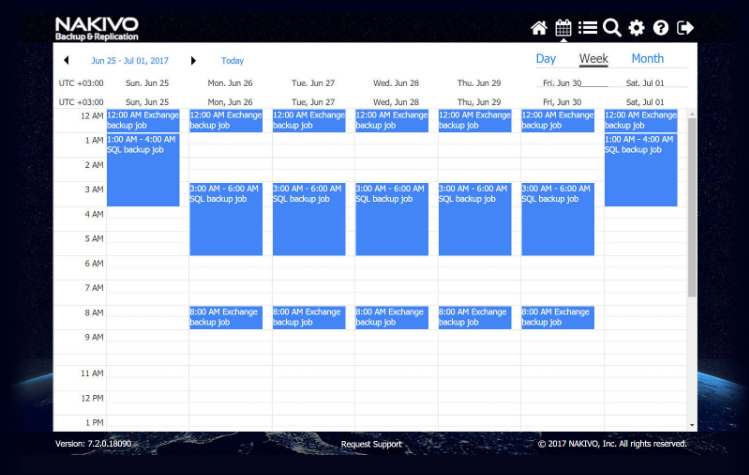 So now you can have a bird’s eye view on all of your jobs (i.e., past, present, and future), instantly see all of the available free time slots, and create a new job right in the Calendar. The feature helps you avoid unnecessary job concurrency without spending too much time. All is done really fast and without extra efforts. Additional built-in features, such as job color coding, day/week/month view of the backup jobs, as well as a flexible job scheduler provide you with an extended control over your VM backup processes. Watch the NAKIVO Backup & Replication v7.2 webinar to learn everyting you wanted to know about our software! NAKIVO Backup & Replication v7.3 Beta Testing Has Started!